Radiant eyes reflect your inner beauty… They deserve to be given the best care and attention. Due to its fragile anatomy and constant facial expressions the eye area is particularly in need of timely, specific and gentle care. Line »ocula« achieves a successful balance of natural, skin identical especially compatible ingredients combined with effective, highly innovative yet non-irritant actives. The »ocula« products have a wonderfully relaxing and calming effect on the eyes, reducing dryness, wrinkles and puffiness while preventing premature tissue exhaustion. Our special tip for the beauty of your eyes: sunglasses are an essential you should never be without! The »ocula« care line is suitable for any age - prevention is better than cure. This oil-free, fresh liquid lotion removes eye make-up instantly and thoroughly. This product fuses the natural cleansing force of water and oil into one product, dissolving Mascara and Lipstick effortlessly. Eye treatment with highly pure, mostly skin-identical ingredients. 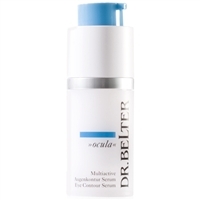 A regenerating, water-free eye treatment to prevent dryness in the sensitive eye area during the night. Cleansing of the eye area is optimally enhanced by this gentle, clear and naturally light brown lotion. This eye contouring gel formula instantly reduces signs of fatigue. A weekly enhancement of regular eye care and special occasions. 10 Collagen Eye Mask treatments, and Sensitive Crystal Gel (a contact gel).